Americans are suckers for great crusades that make the world safe for the pursuit of happiness. In this context, Sanders’s job guarantee seems a masterstroke. The chronically unemployed need jobs; and states and localities have large unmet needs for public and quasi-public services. It’s a bargain made in heaven. even our lefty comrades in social democratic Europe don’t guarantee jobs for everyone. It would cost a fortune; it would massively disrupt the private labor market; it would almost certainly tank productivity; and it’s unlikely in the extreme that the millions of workers in this program could ever be made fully competent at their jobs. Let’s face it, Drum is right. The proposal would cost a fortune; it would massively disrupt the private labor market; it almost certainly would lower the official level of productivity; and millions of workers would probably never be fully competent at their jobs. But that’s only because of how bad things are for workers in the United States right now. 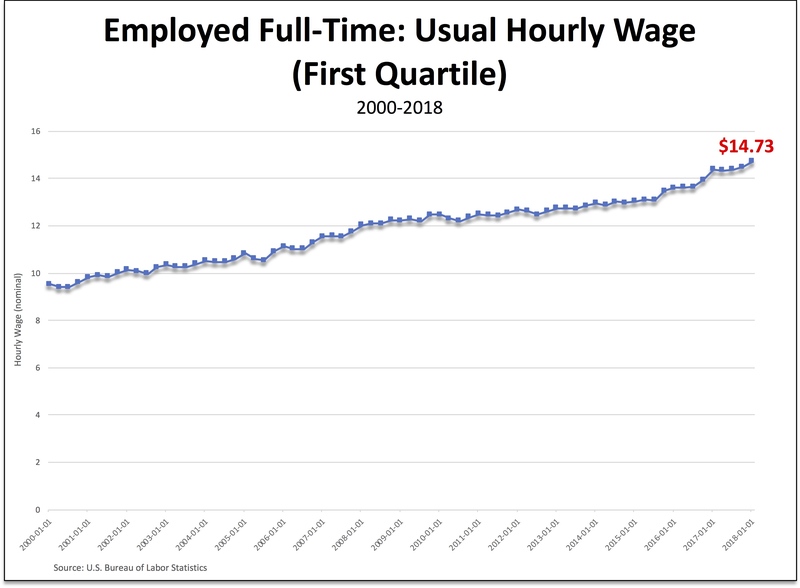 According to my calculations (illustrated in the chart at the top of the post), a quarter of full-time American workers currently earn less than $15 an hour. We’re talking about something on the order of 32 million people. And that’s not even counting part-time and unemployed workers. Plus all the workers, whether or not they currently have a low-paying job, who have costly or substandard health insurance. Employing all those people—at $15 an hour, with medical benefits—would cost a fortune. But not employing them at decent wages already costs the United States a fortune, in individual and social costs. Moreover, there’s no doubt that, if people had a good shot at a federally funded job, they’d be more able to refuse the paltry pay and the indecent kinds of jobs private employers are currently offering. And workers on a federal jobs program might not achieve high levels of productivity—but they would be doing jobs, to repair the economic and social infrastructure, most people would benefit from. Finally, such workers might never become fully competent at their jobs. However, they would develop competencies above and beyond what they can manage to acquire when they’re unemployed or underemployed at their current low-paying jobs. What Drum and others think is a hard-headed, realistic criticism of a job guarantee turns out to be a stinging indictment of American capitalism itself. The fact that there are “50 million people who would be better off with a government-guaranteed job than with the job they have now” calls into question the way the U.S. economy is currently organized. That’s what’s really insane—sticking with the existing labor market, not the idea of proposing a Federal jobs program.